In a gorgeous beachfront mansion in Martha’s Vineyard, Annick and Rebecca have left their young children in the care of their life-long friend Tash. Tash has made millions from her fashion business and treating her friends to a luxury holiday makes all the hard work worthwhile. But by the end of the afternoon, one of the children will have vanished . . .
As the daughter of an iconic actress and an assassinated president, Annick has spent a lifetime running from the truth of her family’s wealth. For her, Rebecca and Tash have always felt more like family than friends. But can she truly trust them with the secret of her past? Known as ‘The Ice Queen’, Anneliese Zander de St Phalle is one of the world’s most celebrated fashion designers. With an empire that stretches across continents, she’s a truly global brand, in every sense. Yet despite her success, she’s a mystery; a reclusive, disciplined perfectionist who rarely grants interviews. She’s successful and she’s talented, and that’s all anyone needs to know. She never talks about her past – not even to her only daughter, Callan. She’s worked hard to leave it all behind and it’s a time and place to which she will never return. Or so she thinks. 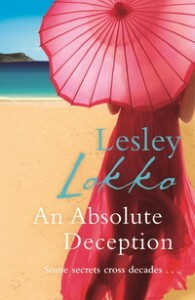 Until, at a New Year’s Eve party at her glamorous Caribbean island hideaway, a woman appears whom Anneliese has done her best to forget. On the cusp of her retirement, at the height of Anneliese’s fame, the stranger brings a story that demands to be told. To Anneliese’s horror, the past cannot be left behind; it is here, part and parcel of the present, despite everything she’s done to forget it. Sam Morland has it all – looks, a glittering career, two homes, a sports car and more money than she can reasonably spend. She’s single but doesn’t spend her days worrying about the fact – she’s too busy living life and loving it to worry about finding Mr Right. He’ll come along one day…and in the meantime, there’s plenty else to do. Abby Barclay is married – the perfect army wife, she comes from a long line of army wives and like her mother and grandmother before her, is accustomed to putting her husband’s career before everything else. In the perfect family, there’s a thin line between love and hate, especially when there’s so much to hide. The Keelers are one of those quintessentially English families that seem to have everything. Glamorous, wealthy and privileged, life has always been easy for them, on the outside at least. But even the happiest of families have their secrets. When the three Keeler sons bring three very different women into the heart of the family, things start to go wrong. Nic Harte is the only daughter of Jim Harte, a white Zimbabwean business tycoon. Despite a life of jaw-dropping wealth and privilege, all Nic has ever wanted is for her father to notice her. Caryn Middleton never met her father, but growing up on a tough London sink estate, she’s had other things to worry about – like getting out of the estate and moving on. Tory Spiller just yearns for some space to be herself. Laure, seventeen, beautiful and already abandoned twice in her young life. Once by the glamorous mother she can barely remember, a woman who brought shame on the St Lazare family name and fled to America; and then again by a handsome soldier who left her pregnant and alone, facing the wrath of her grandmother. Beautiful, spoilt South African diamond heiress Rianne finds her world suddenly turned upside down after a chance encounter with someone she’d rather forget; intelligent, loyal Gabby, always worrying about everyone else, she needs to start looking after No. 1; pretty, petite Natalie, whose shrewd eye for business helps her forget the one man she can’t have and Charmaine, an outrageous flirt, she just needs someone to pay for the good life she so desperately wants.